Kendall Coyne was only 7 years-old when she skated at a hockey camp run by Cammi Granato … and that’s when her Olympic dream truly started. “I still remember that moment of empowerment,” Coyne added. Flash-forward to this past February, playing in her second Winter Olympics, Coyne became a gold medal winner – just like her inspiration, Granato. 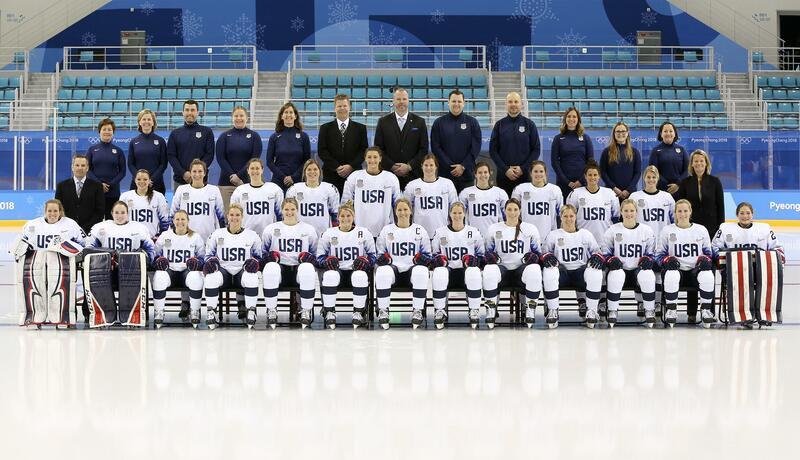 In the third consecutive meeting in the gold medal game between Team USA and Team Canada, the U.S. defeated Canada, 3-2, in a shootout, giving the U.S. its first gold medal in women’s hockey since – you guessed it – since Granato and her team triumphed in 1998 in Nagano, Japan, which was the first time women’s hockey was featured as an Olympic event. 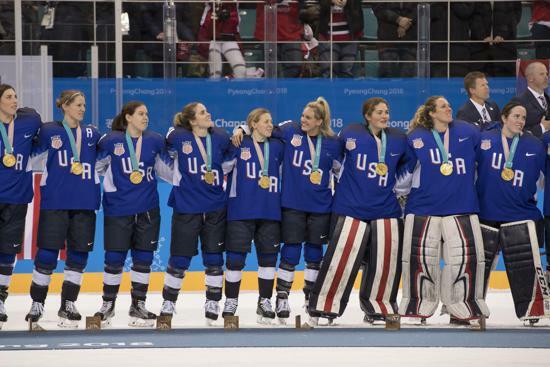 The 2018 gold helped the U.S. – including Coyne – ease the heartache of losing 3-2 in overtime at the 2014 Winter Olympics in Sochi, Russia. Granato talked to the 2018 team via Facetime before the gold medal game. Granato also sent a congratulatory text to Coyne. “To hear from her was really special. I started my dream of going to the Olympics because of her,” said Coyne, now 25, who hails from Palos Heights. 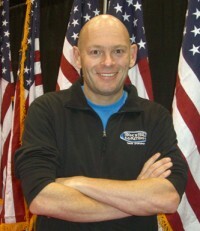 Granato, 46, is from Downers Grove. Yep, Illinois sure has golden glory on the women’s hockey ice. 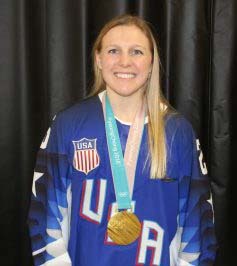 Coyne was in her blue U.S. Olympic jersey, with that beautiful gold medal around her neck, on Saturday, March 24, at the United Center. 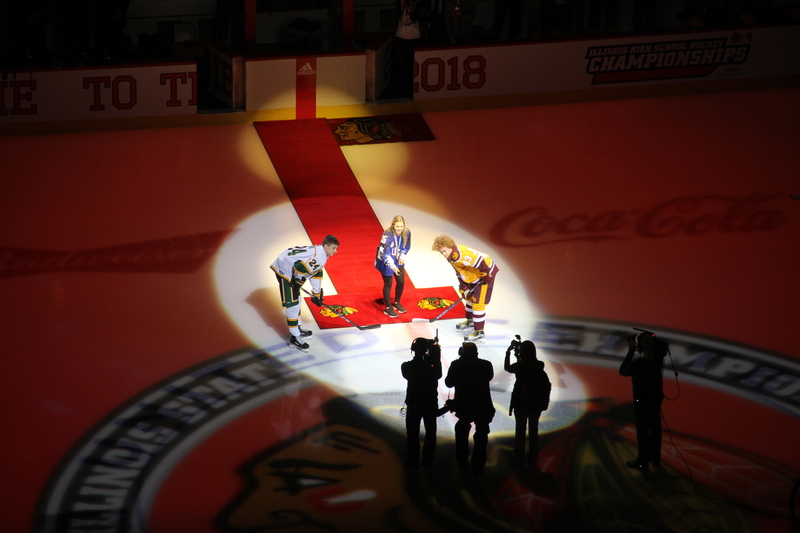 She dropped the ceremonial puck before the girls’ and boys’ state championship games. “To accomplish your childhood dream and then come back to the area where you grew up and share (the medal and the overall experience) with everyone is awesome, really special,” Coyne said. “(The medal) is heavy … but it was weightless in that moment. “I think the most special moment (of the 2018 Olympics) was being locked arm in arm (with my teammates), hearing the National Anthem (played) as the (U.S.) flag was raised (highest as the gold medal-winner). Coyne said she wasn’t crying. Tears were flowing four years earlier, when they won silver in Sochi. “I was in tears (in 2014) … it was heart-breaking. But as I look back on it now, there are a lot of worse things in life,” she said. The 2018 Winter Olympics were held in Pyeongchang, South Korea. “Everyone has been so supportive – from the Chicago Blackhawks to my hometown of Palos (Heights), and literally everyone here. Everyone has been so supportive of my career, my journey, especially these last four years,” Coyne said. Coyne said her overall Olympic experience about a month ago was memorable – from the locals to the country as a whole. “We just had such a good time. We engaged in the culture; we really enjoyed ourselves,” she said. Coyne is getting married in July and said she plans to skate again in a few weeks, now just spending time working out in the gym. “It would be an honor to represent the United States at a third Olympic Games, but am just taking it day by day right now,” she said. On Being a Role-Model: “It’s a platform that’s definitely been earned, something I don’t take lightly or for granted. When I hear that kids look up to me, want to do what I do, I take that very seriously – and I hope I can be the very best role-model for them. ‹ Ask the Official: Should a goal be nullified for playing the puck with a high stick or allowed since it deflected off the opposing team’s goaltender?